Every year Pantone releases it's color of the year and for twenty-sixteen the winners were rose quartz and serenity! I was particularly happy about the rose quartz selection because for as long as I can remember pink has been my go to. That is the girly-girl in me shining right through - no shame. Although I have come to love many other colors and incorporate them into my style, pink has remained a favorite and I am absolutely loving this blush color. This shade of pink is such a feminine and sophisticated color that can easily be incorporated into one's wardrobe. I am particularly a fan of it around this time of year. During the winter months, I tend to gravitate toward wearing more neutrals than I do a lot of color, which to me is appropriate for the season, however it can get a little dull at times and adding a hint of color is a nice change of pace. Throwing some blush colored pieces into the mix adds a subtle hint of color while still maintaining the soft and crisp look of a neutral palate. 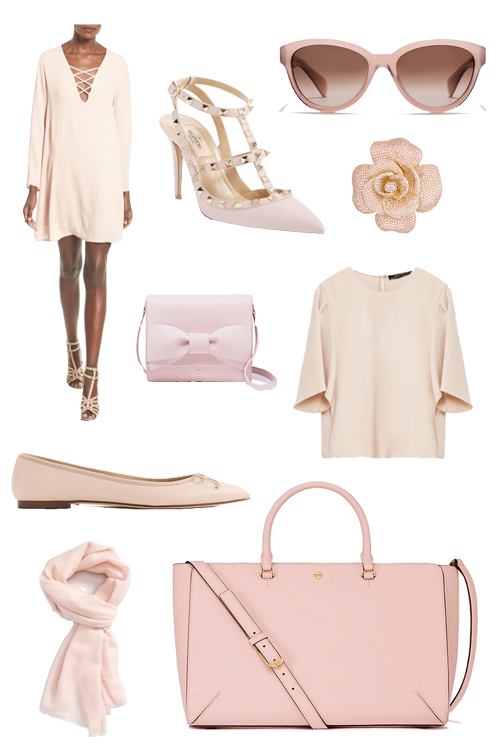 I found a variety of different styles that really highlight just how beautiful this blush color is. These Valentino rockstud pumps are to die for (a girl can dream, right? ), and I think I need this lace-up shift dress. Kate Spade really did a wonderful job with this rose pin, which also comes in the form of earrings and a cuff. If you read my recent post on the new J.Crew sunglass line, I'm sure you are drooling over all of them just like I am, including these beautiful blush Ryan sunnies. I think I've come to the conclusion that anything in this blush color just seems prettier and more feminine! Check out the rest of the styles featured below! Shades of blush might have just become your new best friend. Enjoy!